SPEND THE NIGHT TO EXPERIENCE REAL RANCH LIFE. BRING YOUR DOG. (additional charges apply). Outside kennels. WEDDING LOCATION FOR A RUSTIC WEDDING VENUE. 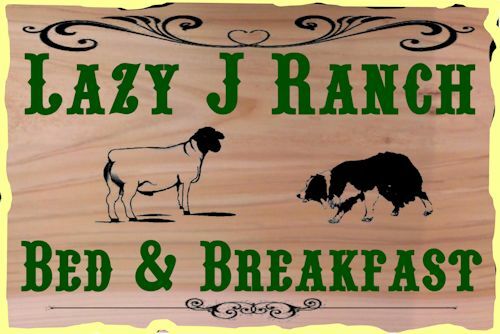 The Lazy J Ranch is a working sheep ranch. There are horses, sheep, cattle, herding dogs and guardian dogs that live with the sheep. It is a perfect place to relax or help with the chores of the working ranch. Lambing time is in early fall and an exciting time to help deliver the new baby lambs. In the morning you will be served a delicious breakfast. You will have the choice of eggs, hash browns, bacon or sausage, homemade breads, pancakes or waffles with coffee, tea and juice. Located in a small beautiful valley called Indian Valley. Ben Ross Reservoir is 2 miles from the ranch. Hiking, mountain biking, boating, fishing or just reading and relaxing. © Lazy J Ranch - All Rights Reserved.